The Constitutional Court of Hungary | DR. ANDRÁS VARGA ZS. Dr. András Varga Zs. was elected Judge of the Constitutional Court by the Hungarian Parliament in September 2014. 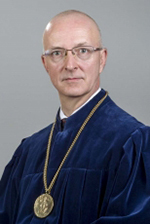 He graduated from the Faculty of Law of Eötvös Loránd University in 1995. Between 1995 and 2000 he worked at the Office of the Parliamentary Commissioner (ombudsman), between 1999 and 2000 as head of the Office. Between 2000–2006 and 2010–2013 he was deputy prosecutor general, after 2013 he has been chief counsellor prosecutor at the Supreme Prosecution Service. He has been teaching constitutional law and administrative law at the Department of Administrative Law of the Faculty of Law at the Pázmány Péter Catholic University. He has been chief of the Department since June 2008 and he was dean between 2013 and 2016. He was awarded the PhD degree in 2003, habilitated in 2010 and became university professor in September 2012. Since October 2013 he has been the Hungarian member of the Venice Commission of the Coucil of Europe.